Chloé's Ramblings: TDC Blog hop! Welcome to the French step of TDC's blog hop! You should have traveled aaaaaaall the way from Japan (Holly's blog) and your next stop is Michelle Batton's FB page. If you get lost along the way you can start back here. 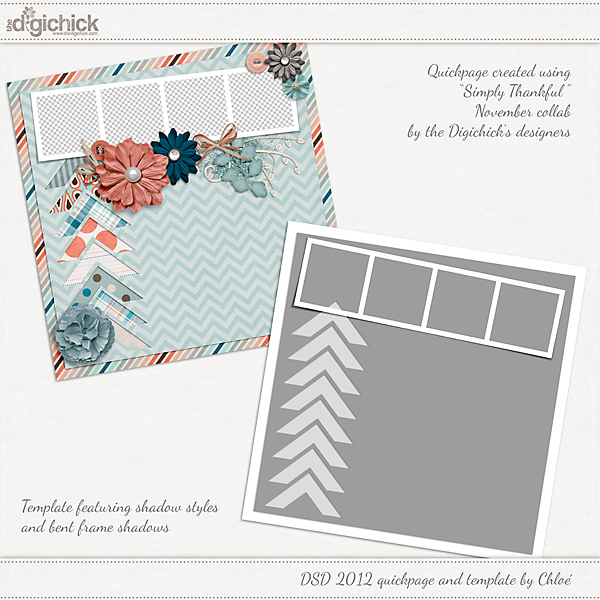 My freebie is a quickpage / template pack. "Template" is a bit too ambitious of a word for this, actually. I just created the chevrons and the folded frame skeleton but the rest of the page is up to you. One thing that could be fun to do is to use this big white space for title, journaling, or even a blended pic, watcha think? Just a word about the chevrons, since I'm at it! I created those as shapes and applied an inner shadow to create the "cut out effect" to them. That way, you can clip different papers to each of them (like I did in the quickpage), clip the same paper as the background one to increase the cut out look, or even ditch the inner shadow completely, apply a regular shadow and change the cut outs in paper pieces. This is truely a perfect example of how versatile digi scrapping is, and of one of my main reason for LOVING this hobby of ours! Anyway, hope you'll enjoy those goodies. Please shoot me a comment and link me up if you use those, I'd love to see your creations!! I'll host an International Chat on Sunday. It'll be at 11AM (Paris Time) = 10AM (England Time) = 7 PM (Japan Time) = 5 AM (EST). I won't post the PST time, it's indecent! LOL If you're around, please come hang out with us, it'll be fun! ETA: sorry, I'm a dork, I forgot the link to download the freebie! DOH!!! I guess that's what you get for writing a blog post after your b'day party (with champagne!) LOL It's fixed, now! EATA (edited again to add... yep, totally made that one up! ): Apparently my box account is out of bandwith. I'll try to get this solved later today, please come back in a dozen hours and thanks for your patience! EAATTA (edited again another time to add): Here is a new link to download the template. This one is via 4shared. Let me know if you have any trouble and THANKS for your interest in the freebie!! thank you for the great template- I love inner shadows for cut outs!! however I can't seem to find the download link? Love both the QP and template but can't seem to find a place to download. The image does not seem to be linked ????? Am I missing something ?? chloeee love the template :) thanks! thanks! thanks! Thank you, Chloe! Your templates are so amazing! You have quite a geometric eye, my friend! thanks for the gift and the tips! You may think that template may be too ambitious but I think it's great! It's simple & striking. THANKS so very much! Box says you are out of banwith. Thanks anyway for the offer. I love your template, and I would love to download it, but it is telling me you are out of bandwidth to download? Is there another place to download? Thank you! Seems you are out of bandwidth. Nice work though. beautiful qp/template...I have tried for the past few days to dl, but you're out of bandwidth. :( I'll try back one more time tomorrow. I am in love w/ the chevron patterns these days! Thank you for the new link but unfortunately it for the InternationalChat Calendar Template!